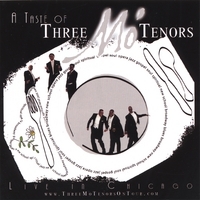 On Tuesday, March 28, 2006, I had the pleasure of attending the musical show, Three Mo Tenors. As indicated by the title, the show consisted of three singers: Kenneth D. Alston Jr., Ramone Diggs, and Marvin Scott. The talent of these three African American men cannot be questioned once they began to sing. The show was hosted on the campus of Coppin State University in the auditorium. I was fortunate enough to find seating amongst an audience as diverse as the selections that the trio sung for us. There was a variety of music from classical and Broadway to jazz, soul to blues, and hip hop to gospel and spiritual. All tastes were satisfied as the young men belted out song after song without a note sung out of key or a voice cracking. One song that was extremely popular was Cab Calloway’s, “Minnie the Moocher”. Marvin Scott sung this and even invited the audience to participate. I found myself among the many who were clapping and rocking so hard from side to side that I expected to keel right on over. Each of these young men have had outstanding training with their voices which is why each note was crisp and clear and each song was delivered just as the original artist had delievered it. The Three even added elements of comedy, donning turned-to-the-side baseball caps when they sang Usher’s, “Yeah”. There was so much feeling in that auditorium each time their mouths were opened that you barely had time to wipe your tears before you were laughing all over the place. The trio even paid homage to Ray Charles, performing a medley of his popular songs, “Don’t Set Me Free”, “Hit the Road Jack”, and “Georgia on my Mind”. There was not a dry eye in the place. I sat in my chair listening to classical music, enjoying it. What I could appreciate about the show was the fact that it was being shown in a local area where many people had access to it. As well, they should be willing to because there is not even a scale to measure it against. In addition, an element of the show was the lighting that was provided. For each song, there was a theme and the theme would be colored and shown against the background in colorful displays. Whatever your tastes are, this show is definitely a must see. Bravissimo!